Because trilobites are so diverse in the fossil record, are found on all continents, and while individual species occupy distinct and narrow stratigraphic ranges, in total they cover nearly the entire duration of the Paleozoic Era, their fossils play a major role in determining the order and age of global geological strata. Using the preserved remains of living things to study the relative age of geological strata is called biostratigraphy, and trilobites are among several groups of organisms that play major roles in such studies. A very brief history of biostratigraphy reveals several basic principles that were established over the centuries. In the late 1600s, Nicolaus Steno established the proposition that rock layers should lie over one another in the order of their age, the oldest at the bottom, and the youngest deposited on top (the Law of Superposition). We know that there are many exceptions to this, because of geological processes such as tectonics, metamorphic folding, subduction, etc., but these processes are added to the basic principal of deeper=older. 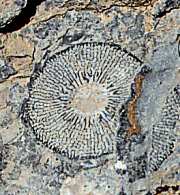 By the end of the 18th century, fossils were accepted as remains of past life, and in the early 1800s William Smith (England), and George Cuvier and Alexandre Brongniart (France) documented that different layers contained distinctive fossils that characterized their chronological periods, opening the doors to the use of fossils to establish a sequence of rock layers through time, and across global geographies. The basic stratigraphic unit is the biozone. It is defined by the First Appearence Datum (FAD) of a specific short-range index species, and ends at the FAD of the next chosen index species. The first index species can also occur in the second biozone. 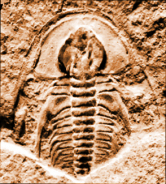 By the 1890s, several of the main divisions of the Paleozoic era, such as the Cambrian and Carboniferous periods were internationally recognized. It was not until the 20th century, however, that the study of radioactive decay allowed scientists to date rocks via their isotope proportions, finally giving absolute ages to the relative ages of the geological time scale. Because of the long history of the use of fossils to establish geological time, the boundaries of the different eras (e.g., Paleozoic, Mesozoic, Cenozoic) and Periods (e.g., Cambrian, Ordovician, Silurian) are based on major changes in the fossils found in the rock, and thus in the faunas that lived then. This has entered popular knowledge: the Mesozoic is the "Age of Dinosaurs", and the Paleozoic is the era marked by trilobites. The chart at right (adapted from Tormo 2002) shows geological strata of the middle Middle Cambrian in the Montagne Noire area, southern France, SW Europe, and the trilobites found within them (various species of Solenopleuridae), recording their presence as dots on the right half of the chart. Different species characterize the succeeding strata. Some species' FAD and ranges occur within a single lithographic type, while others are found across different strata. Specimens of Solenopleuropsis ribeiro, disappear after the lower Solenopleuropsis (Manublesia) phylozone, then reappear after two intervening strata (purple and orange). This seeming "resurrection" from extinction is called the Lazarus Effect. Different layers of geological stratigraphy correspond to different units of time (chronology), so the strata, or the time period assigned to them bear the same names, but different units. The table at right shows the equivalence of these units. The Cambrian System, for example, refers to the lowest strata of the Paleozoic Erathem, characterized by particular fossils and geological features. These have been dated, and the period of time is called the Cambrian Period, and covers a currently defined chronology from 542 to 488 million years before present. Age = 3-10 my. Example: Emsian, Pragian, and Lochkovian Ages of the Early Devonian Epoch. As mentioned earlier, trilobites play a large role in the biostratigraphy of the Paleozoic, but their major utility is in the Cambrian, when trilobite diversity was at its greatest. 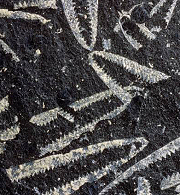 The emerging standards for the Ordovician, in contrast, rely much more on graptolites (colonial marine invertebrates with distinctive skeletons). 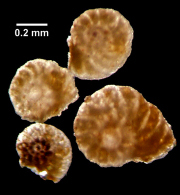 Other major fossil groups used along with trilobites for biostratigraphy include foraminifera (tiny planktonic single-celled eukaryotes rather like amoebas with shells), conodonts (the hard mouthparts of jawless, swimming marine vertebrates), and archaeocyathans (early Cambrian sponge-like creatures that formed the first reefs, living in cup-shaped calcium carbonate structures). Representatives of these fossils are shown below. Using the relative patterns of stratigraphy that emerged from the study of these different fossils, scientists (separately at first, but now as international committees) continue to refine the geological time scale, combining geology, paleontology, and radioisotope chronology to set benchmarks in time across the globe. We have seen how the different orders of trilobites were related, and how they extended across various portions of the Paleozoic (chart below). The Order Redlichiida, for example, exists entirely within the Lower and Middle Series of the Cambrian System, and the Order Asaphida has its heyday in the Ordovician. 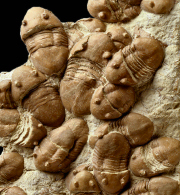 By the last stages of the Devonian System, all of the orders of trilobites were no longer found, save the Proetida, which persisted in the post Devonian periods until the extinction of trilobites at the end of the Permian, the last period of the Paleozoic. But looking closer, we see that subgroups of the orders mark other subdividions in biostratigraphy. The Olenellina, considered the most primitive of trilobites, disappear at the end of Cambrian Epoch 2, the boundary between the Early and Middle Cambrian, and the Suborder Eodiscina of the Order Agnostida does not persist past Epoch 3 (end of the Middle Cambrian). 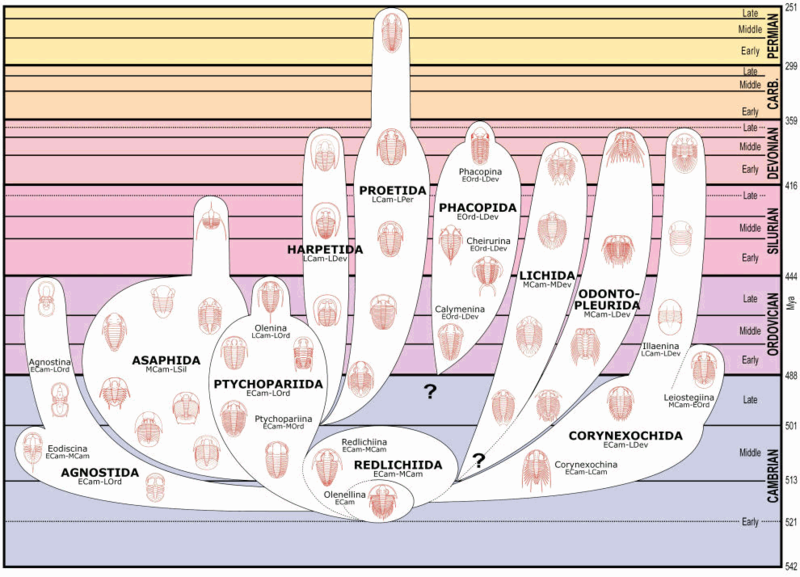 See the page on Trilobite Systematic Relationships for a fuller discussion. Whittington et al (1997 -- the "Trilobite Treatise") includes a section on biostratigraphy of the Cambrian, containing several excellent examples of the role of trilobites in biostratigraphy. It points out that the very earliest Cambrian is without trilobites, and the zonations use instead trace fossils and small shelly fossils (so called because we still don't have a clear idea of what the small shells were part of). The 2005 update on Cambrian chronostratigraphy (Babcock et al 2005) divides the Cambrian Period into four Epochs/Series (Series 1, Series 2, Series 3, and the Furongian, the only series officially designated with a name. These series are broken further into ten Stages (based on the FAD and ranges of particular species assemblages). There is a strong endemism, particularly in the earliest two series in the Cambrian, that resists a single set of agreed-upon stages. For example, the trilobites that characterize Laurentia (North America) are not found on other continents at all. Nonetheless, there are some patterns observed among rare species of widespread paleobiogeography. 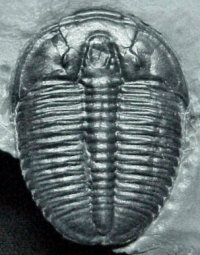 The earliest trilobites appear in Laurentia (Fritzaspis), Siberia (Profallotaspis), and Morocco (Hupetina and Eofallotaspis). These mark the boundary between the Cambrian Terreneuvian Series (lacking trilobites), and Cambrian Series 2. In the mid-Cambrian Series 3, agnostoids such as Ptychagnostus (=Acidusus) spp., Triplagnostus gibbus, and Goniagnostus nathorsti allow for correlations between Australia, Kazakhstan, Siberia, and Scandinavia. The widespread outer-shelf agnostine Lejopyge laevigata is the start point and major signature species of Cambrian Series 3, Stage 7. 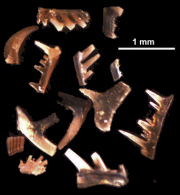 The bottom of the Furongian Series (formerly Upper Cambrian) is characterized by the FAD of Glyptagnostus reticulatus across Siberia, Kazakhstan, and Australia. Agnostoideans also demark the last two stages of the Furongian Series. The chart below, adapted from Babcock et al (2005) shows the role of trilobites (in bold) in the boundary delineations of the Zones and Stages of the Cambrian. Other endemic taxa and their paleocontinents are included for interest, but the listing is not exhaustive. Colors used for the Systems, Series, and Stages are via the International Stratigraphic Chart 2008. The chart continues to be developed, and only three of the boundary points (called Global boundary Stratotype Section and Point -- GSSP) have been formally accepted (indicated below with a red GSSP note). The rest are emerging consensus markers that eventually will be published formally, pending further discussion. Below the chart are some images of Cambrian trilobites of biostratigraphic importance. The name Cambrian was introduced in geology by Murchison and Sedgwick in 1835. The name comes from the Celtic Cambria, the classical name for Wales, UK, and was used to designate a thick lithological series there. Only lithological critera was used by early workers, with little agreement on age or boundaries. Following on the pioneering works of Smith, Dalman (1827) distinguish two faunas in Scandinavia, Olenellus and Paradoxides, and Brögger (1876) recognized their order of appearance (Olenellus the earlier). Walcott (1886/1891) used these faunas to establish disctinctions within the Cambrian that were long-held: An Olenus fauna was named the Potsdamian, and later, the Upper Cambrian. A Paradoxides fauna was named the Acadian, and defined the Middle Cambrian. The Olenellus fauna was named the Georgian, and was considered the Lower Cambrian. This three-part division of the Cambrian was adopted by generations of workers, and is only presently being superceded by the four series system above. The discovery of fossils of undetermined affinity in strata lower than trilobites (the "small shelly fossils" fauna) extended the Cambrian lower than it was previously set, and this pre-trilobite series is now considered the lowest Cambrian. Babcock, L.E., S Peng, G. Geyer, & J.H. Shergold. 2005. Changing perspectives on Cambrian chronostratigraphy and progress toward subdivision of the Cambrian System. Geosci. Journal 9(2):101-6. Dalman, J. W. 1827. Om Palæaderna eller de så kallade Trilobiterna. Kungliga Svenska Vetenskaps-Akademiens Handlingar 1: 226-294. Geyer, G. & J. Shergold. 2000. The quest for internationally recognized divisions of Cambrian time. Episodes 23(3):188-195. Murchison, R. I. 1835. On the Silurian System of rocks. London and Edinburgh Philosophical Magazine of Journal Sciences (series 3) 7: 46-52. Murchison, R. I. 1854. Siluria. The History of the Oldest known Rocks containing Organic Remains, with a Brief Sketch of the Distribution of Gold over Earth. John Murray, London, 523 p.
Sedgwick, A. 1852. On the classification and nomenclature of the Lower Palaeozoic rocks of England and Wales. Quarterly Journal of the Geological Society of London 8: 136-168. Sedgwick, A. 1855 (in SEDGWICK A. & MCCOY F.). A Synopsis of the Classification of the British Palaeozoic Rocks with a Systematic Description of the British Palaeozoic Fossils in the Geological Museum of the University of Cambridge. University Press, London; Cambridge, 832 p.
Sedgwick, A. 1873 (in SALTER J. W.). A Catalogue of the Collection of Cambrian and Silurian Fossils Contained in the Geological Museum of the University of Cambridge. University Press, Cambridge. Smith, W., 1815, A memoir to the map and delineation of the strata of England and Wales, with a part of Scotland: John Cary, London, 51p. Smith, W. 1816-1819, Strata identified by organized fossils containing prints on coloured paper of the most characteristic specimens in each stratum: W. Arding, London, 32p., 17 plates. Smith, W. 1817, Stratigraphical system of organized fossils, with reference to the specimens of the original collection in the British Museum: explaining their state of preservation and their use in identifying the British strata: E. Williams, London, 118p. Shergold, J.H. 1997. Explanatory notes for the Cambrian correlation chart. In: Whittington, H.B. et al. Treatise on Invertebrate Paleontology, Part O, Arthropoda 1 Trilobita (Revised). The Geological Society of America and the University of Kansas. Steno, N. 1669, De solido intra solidum naturaliter contento dissertationis prodomus: Florence, 76p. Tormo, N. 2002. La Formation de Coulouma (Cambrien moyen) dans l'unité de Mélagues (Versant Nord de la Montagne Noire, France). Lithostratigraphie, biostratigraphie et aperçu paléogéographique. Bull. Soc. Et. Sci. Nat. de Béziers: 19(60) 45-104. Walcott, C. D. 1886. Studies on the Cambrian fauna of North America. Bulletin of the U.S. Geological Survey 30: 12-13. Walcott, C. D. 1888. The stratigraphical succession of the Cambrian faunas in North America. Nature 38: 551. Walcott, C. D. 1891. Correlation Papers - Cambrian. Bulletin of the U.S. Geological Survey 81: 1-477. White, A. Toby. The Furongian (Late Cambrian). http://www.palaeos.com/Paleozoic/Cambrian/LateCam.html from the Palaeos website: White, A.T. & M.A. Kazlev (2002-ongoing). during the development of this page!